ConverterXpress.com was a professional multimedia platform that provided the best video, audio and photograph solutions for personal entertainment. They specialized in developing easy-to-use high-tech multimedia software in the field of video conversion, video downloading, and BDIDVD ripping along with powerful editing functions. We keep improving our functions and performance, in order to provide best multimedia products for users. Our products would be your best choice for excellent image and sound quality. The most important note is that our products are easy use- there are no difficulties operating them. Our mission is to provide the best product and service to all the customers. We will try our best to satisfy our customer's demand. Let‘s find fun together! Better together! Output optimized profiles for Android devices like Kindle Fire, Nook Tablet, Galaxy S4, Galaxy S3 Tab 3, Nexus 7 tablet, Galaxy Note 10.1 and so on. 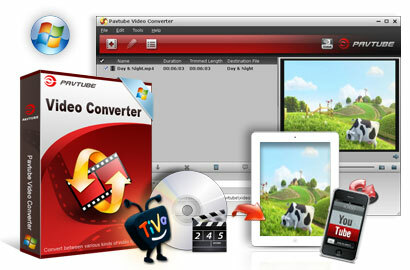 Video Converter is a great piece of software with extremely powerful and full-featured functions to convert any video format for various media players, personal portable devices, video editing software and others (e.g YouTube video compatible). As the best video converter software, it supports converting all video such as MP4, MKV, WMV, AVI, Quick Time MOV, DivX, MTS, M2TS, MXF/P2 MXF, MOD, H.264/MP4 AVC, HD WMV etc. to popular SD, HD and 3D video formats. In addition, it can also extract audio track from video files and convert them to MP3, AAC, AC3, AIFF, OGG, M4V, MP2, WAV, WMA, etc. The platinum version of this video converter can perfectly convert 2D video to 3D formats and provide users with multiple 3D modes including Anaglyph 3D, Side by Side 3D, and Top and Bottom 3D. This excellent video conversion program is also multifunctional video editor software comprising functions of adjusting video effect, trimming video clips, cropping video playing area, adding watermark to video and merging multiple video clips. Support "Copy the entire disc" to remain DVD's original file structure. Have you ever wanted to backup, edit, share and play DVD movie? DVD Ripper is excellent software, which is designed to solve all the problem above for Windows users. This easy-to-use software provides you with fastest speed to rip DVD tablet, smartphone, etc. on Windows and convert DVD to MP4 supported by Android devices, such as Samsung Galaxy series, Nokia Lumia 920, the HTC One smartphone, etc. It supports ripping DVD to popular HD and SD video formats, such as AVI, MOV, WMV, MP4, MKV, VOB, etc. Moreover, it could easily extract audio track from DVD and convert it to popular audio formats. The platinum version of this Mac DVD Ripper even could convert DVD to 3D video files and provides users with multiple 3D modes including Anaglyph 3D, Side by Side 3D, and Top and Bottom 3D. Users is able to effortlessly adjust the output video effect including brightness, contrast, hue, saturation and hue, crop black bars from video, trim video clips, add text or image watermark to video, and merge multiple files into a single one. The best DVD Ripper could easily rip DVD to MP4, H.264, AVI, MP3, WMV, WMA, FLV, MKV, MPEG-1, MPEG-2, 3GP, 3GPP, VOB, DivX, MOV, RM, RMVB, WebM, DPG, M4A, AAC, WAV, FLAC, etc. and HD formats like HD H.264, HD AVI, HD MPG, HD WMV, HD MOV, HD ASF, etc. It can rip DVD to iPad (iPad 4, iPad mini), iPhone , iPod touch, iPod nano, iPod classic, Surface, Samsung Galaxy S, Samsung GALAXY Note, Nexus, Kindle Fire, BlackBerry, Nokia (Lumia series), PSP, PS3, Apple TV, Xbox, Android Phones, NDS, etc. DVD Ripper takes full advantage of NVIDIA's CUDA technology and ATI Stream (AMD APP) technology to largely accelerate conversion speed. The GPU acceleration saves users lots of time when using H.264 codec to do format conversion. NOTE: To use GPU computing feature, a CUDA-compatible NVIDIA graphics card or an AMD graphics card with AMD APP technology must be installed. The CUDA and AMD APP acceleration both work only when creating H.264 encoded video files. The platinum version supports ripping DVD to 3D videos with five modes: Anaglyph (Red/cyan), Side By Side (Full), Side by Side (Half-Width), Top and Bottom (Full), Top and Bottom (Half-Height). And you can save 3D video in MP4, MKV, TS, AVI and FLV format. DVD Ripper adopts advanced audio and video in sync technology, which guarantees you a perfect playback performance. All commercial DVD (including DVD with the restriction of CSS, Region, RCE, Sony ARccOS).